Former Indian Grady Sizemore played his first game in Cleveland since the end of the 2011 season. 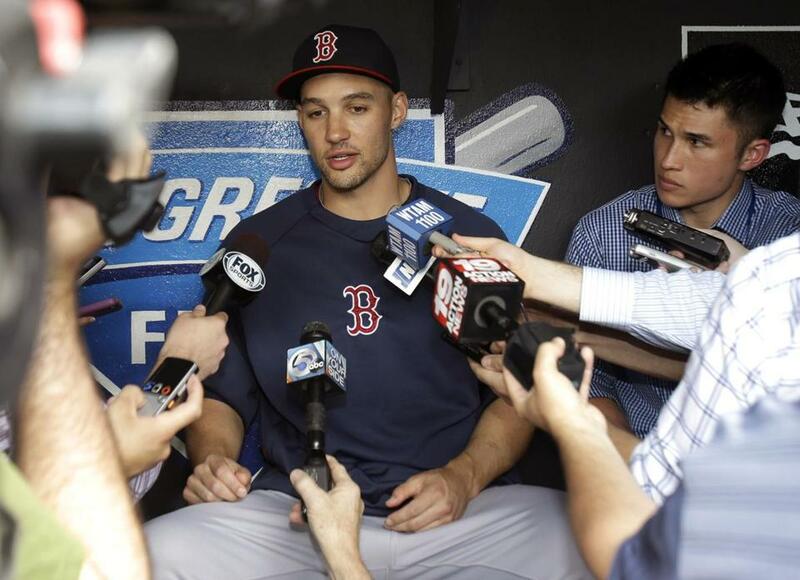 CLEVELAND — There were a dozen reporters and four television cameras waiting for Grady Sizemore when he walked into an unfamiliar dugout on Monday wearing what for fans of the Indians was a most unfamiliar uniform. Sizemore is a secondary contributor for the Red Sox, a player who was struggling for at-bats just a few weeks ago before playing time opened up with Shane Victorino going on the disabled list. But for the Indians, Sizemore is a reminder of past glories. He played eight seasons in Cleveland, making the All-Star team three times and winning two Gold Gloves in center field. Sizemore was 25 in 2007 when he helped lead the Indians to the American League Central title. Cleveland beat the Yankees in the first round of the playoffs and pushed the Red Sox to seven games in the ALCS. But Sizemore’s career started collapsing in 2009 as injuries mounted. First it was his left elbow and then his left knee. He needed surgery to repair a hernia and then another for his lower back. By 2010, Sizemore was out of the lineup more than he was in it. The Indians gave him one final chance in 2012 but he missed the entire season. Sizemore skipped 2013 entirely. Now 31, Sizemore is with the Sox on a one-year deal trying to make a comeback. The small crowd showed little reaction when Sizemore came up in the second inning. Until Monday, his last game in Cleveland was Sept. 22, 2011. Sizemore was hitting .211 with a .287 on-base percentage on May 24 and appeared like a candidate to be released. He is 9 for 31 in the eight games since with four extra-base hits and two steals. Sizemore admitted he is surprised his body has held up after such a long absence from the game. He attributes his uptick in performance to getting more playing time. Brock Holt started at first base for the second straight game and hit leadoff again. The return of shortstop Stephen Drew did not bump him out of the lineup. But first base will not be an option much longer. Mike Napoli took batting practice on Monday and should be able to come off the disabled list on Sunday, the first day he is eligible to return. The swelling has gone down in Napoli’s sprained left ring finger and the hamstring and calf strains he was dealing with have abated. Once Napoli returns, Holt could become part of a left-field platoon with Jonny Gomes. “He’s starting to get some work in BP this week running down some balls in the outfield. We’re going to look at every possibility to keep him in the lineup. We’re certainly open-minded to it,” Farrell said. When the Red Sox signed Drew May 21, Farrell said that Xander Bogaerts would still play shortstop when Drew was out of the lineup. Bogaerts, he said, also would get pregame work at shortstop. But on Monday, with Drew back in the lineup after seven games in the minors, the plan changed for Bogaerts. Farrell said that could change if the Red Sox come up with a righthanded option for third base. Then perhaps Bogaerts would move to shortstop against lefthanded starters. Will Middlebrooks represents that possibility once he returns from the disabled list and a rehabilitation stint. Clay Buchholz was scheduled to throw a simulated game Monday. That was pushed back to Saturday, the latest sign that the Red Sox are in no rush to have the righthander come off the disabled list any time soon. “We’ve adjusted the plan originally set out to take advantage of the time right now to keep working on the delivery [flaws] that have been identified,” Farrell said. “There was some work done in the bullpen [Monday], there will be another bullpen on Wednesday. David Ortiz fell into second place in the latest All-Star Game vote totals. Nelson Cruz of the Orioles now leads at designated hitter with 888,855 votes. Ortiz is second at 766,631. Ortiz has been elected by the fans for three years in a row and has been an All-Star nine times. Through Sunday, Cruz led the majors with 20 home runs and 52 RBIs. Cruz has actually played more games in the outfield (31) than at DH (23). Dustin Pedroia is running third in the voting at second base with 540,515 votes. He is well behind Robinson Cano of the Mariners (726,158) and Detroit’s Ian Kinsler (649,926). The only other Red Sox player listed among the leaders is catcher A.J. Pierzynski. He is in fifth place. The All-Star Game is July 15 in Minnesota. Victorino, out with a right hamstring strain, is doing what was described as “light running” but there is no schedule for anything beyond that . . . Mike Carp officially went on the disabled list with a fractured fourth metatarsal in his right foot. He was placed in a non-weight-bearing boot for a week and will start rehab after that. He is not on the road trip . . . Ryan Lavarnway will have surgery on the broken hamate bone in his left wrist on Tuesday at the Cleveland Clinic. He is expected to miss 4-6 weeks . . . Pierzynski was 0 for 3 to snap a 10-game hitting streak . . . The Red Sox are 3-7 against AL Central teams . . . The Sox fell to 7-13 in one-run games. Peter Abraham can be reached at pabraham@globe.com. Follow him in Twitter @peteabe.